Our guest for March’s Saint Audio Mix is Noktiluc, a Boston-based producer original hailing from Argentina. Read on for the interview, and listen to his mix below. Tell me about your production style and how you got started. What I try to do when I compose music is include things that inspire me. Sometimes they are movies, sometimes they are poems, sometimes they are songs. I do a lot of sampling, I sample all the things that inspire me. Sometimes I even record spaces that I like. There’s a lake where I live and sometimes I go and record sounds from there. So that’s usually where it starts, with sounds from different things that inspire me. Have you lived in Boston forever, or did you live elsewhere? No, I was born in Argentina, in Buenos Aires, and I lived there until I was 18 years old. Then I moved to Boston to study electronic production and sound design [at Berklee College of Music], to compose music. So, I’ve been living here for 5 years now. Yes, absolutely. I recently moved to a place outside the city. I have a lot of time by myself, its very quiet, and I really like where I’m living now. I’ve been producing for about 7 years. I’ve been focusing only on production for 5 years; before that, I was playing guitar a lot, as I studied classical music in Buenos Aires. I was playing classical guitar, but since I moved to Boston I’ve been focusing only in production. After studying at Berklee, how would you say your style has changed from when you first started producing, and in what ways? That’s a good question. I think that over the years I realized that I have more freedom than I thought I’d have, and going to Berklee I gained confidence while spending time with all the artists and it made me realize that I could do whatever I wanted to do. That really influenced my style. Before that I was just trying to have a sound that’s easy to sell, I guess. I was trying to be more mainstream when I was younger; now I’m more about just things that are honest and valuable. How is the Boston electronic scene? It’s pretty small, most of the people that I know that are in the music scene are people I met at Berklee. There are some more artists that I really like that are from here, one of my best friends – he just moved to Rhode Island actually – his name is Robert Love, and he’s a huge influence for me. Tell me about your name – where did it come from, and does it have a special meaning? It’s actually kind of hard to explain. 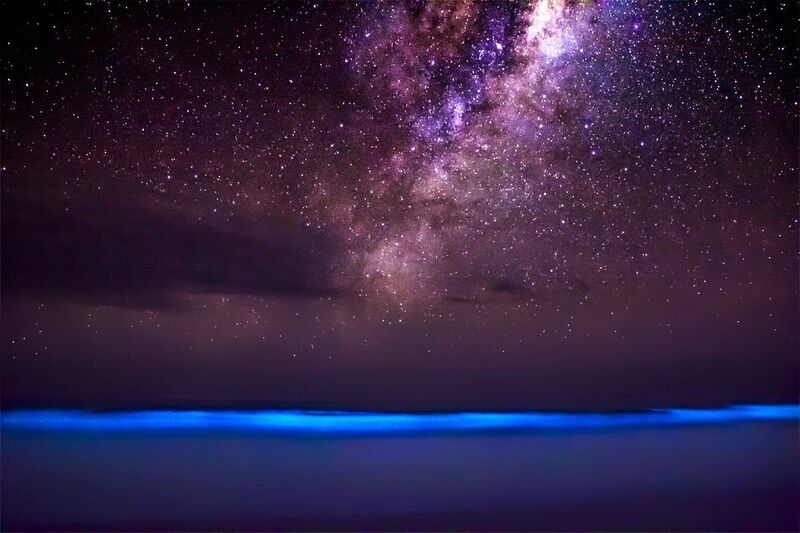 I used to go to Uruguay every year in the summer with my family, and at night, when you go to the beach, you can see the waves shining [due to noctiluca scintillans], and its an incredible experience. I tried to represent things that made people really know about my life, with everything I do – music, the titles of my songs, the art for my EP, and my name… they are all things that say something about the things I love. So that’s one thing that really interests me. When I started this project, I was thinking about how I wanted to sound like or what I wanted to communicate, that was an experience that came to my mind and that’s how I got that name. Let’s talk a little bit about the “Irracional” music video. The music video I did last year in Argentina. I had a friend there who does film production and film direction and asked me if I wanted to do some performance… they had a factory that was empty and they were asking if I wanted to go there and record some music. So I prepared a little piece, and then went there and improvised for about 5 hours, I would say, until they had the music that I liked. They recorded for 5 hours different takes – the video is just me performing with a Roland TR-8 drum machine, and an MPC to trigger Ableton clips. They recorded a lot of things, and I recorded a lot of audio, and from there I did some tweaks to the improv. That’s how we did it! When you perform, what equipment do you use? It depends. I really like doing live sets with Ableton and the TR-8, but I also like DJing too. I think there are different ways of performing… sometimes I try to combine them, and use samples from movies I like, or speeches that really inspire me, so when I DJ I like to have Ableton open so I can trigger some a cappellas and go from there. I use both – DJing, Ableton, and the TR-8. The mix I recorded, I was doing a DJ set, and tried to get a good vibe, but have something that you can listen to at home. It was kind of a challenge for me, because when you’re playing in front of a crowd you have their reaction on what to do, and you react to their reaction. It was a very interesting experience, and I tried to combine the different styles… I don’t like doing just one thing, I try to be as open as possible… so I hope you enjoy it!